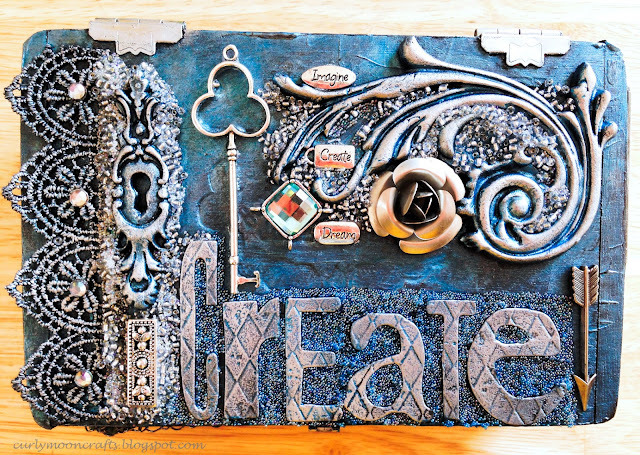 Hi Friends: Today's project is an altered cigar box that I decorated with Creative Paperclay embellishments made from some Prima IOD moulds. I plan to use this box to store my Paperclay pieces that are ready to be used on other products. It's my project for a Design Team application for Creative Paperclay - I love, love, love this product. (I hate to say that out loud - you know what they say about telling people about your birthday candle wishes!) You can find more information and inspiration at the Creative Paperclay Blog and join in some fun with the Creative Paperclay Facebook page, too. One of the best things about having a father-in-law that smokes cigars is that I get to inherit all of the lovely wood cigar boxes once he's smoked all the cigars! Here are pictures of the finished project - I love the way it turned out. And, of course, it's blue and silver - love the colors! Here's the top of the box - I love the keyhole and the large flourish that were made with Creative Paperclay, then colored with Inka Gold and Prima Metallique Wax. 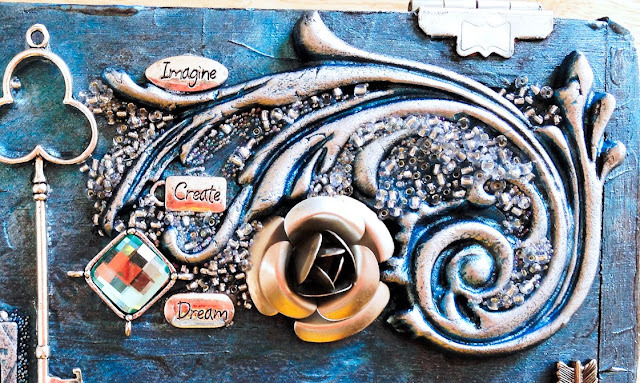 Use Creative Paperclay with the Keyholes and Large Flourish IOD moulds to create beautiful elements to add to your project - simply work the Paperclay into a ball, flatten it, and press it into the moulds, remove the excess, then allow to dry. Remove the pieces from the moulds, then simply file or use your fingers to remove any excess pieces of material that you didn't quite get when you filled the mould. 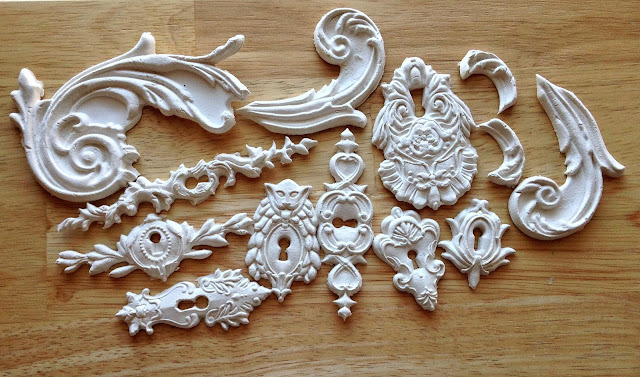 I made all of the keyholes and flourishes in the moulds at once so that I would have extra finished pieces for future projects - aren't they lovely? Prep the entire cigar box with black gesso. Once dry, paint the box with Steel Blue Inka Gold. 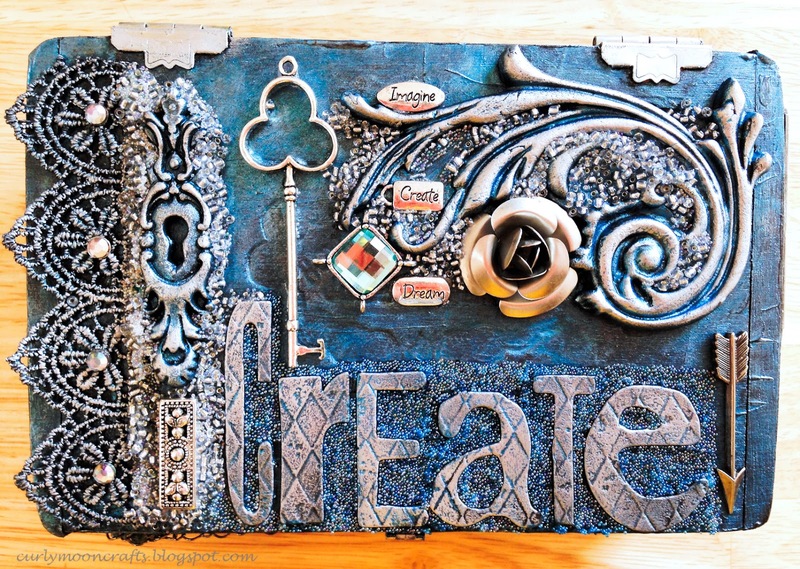 Glue Creative Paperclay keyholes and flourish, chipboard letters, and lace to the box, then cover with black gesso. Once dry, paint the pieces with the same Steel Blue Inka Gold, then enhance with the Old Silver Metallique wax. 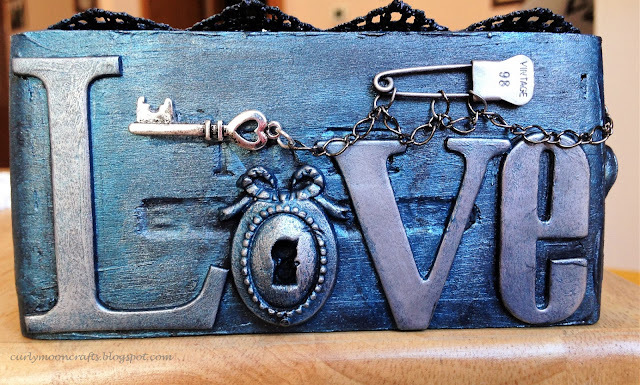 For the charms on the sides of the box, link them together with chain and trinket pins. Glue all of the jewelry pieces, charms, trinket pins, word bands, and other metal embellishments in place. Enhance the trinket pins and word bands with the Old Silver wax - this changes the color to match and lets the words shine through. 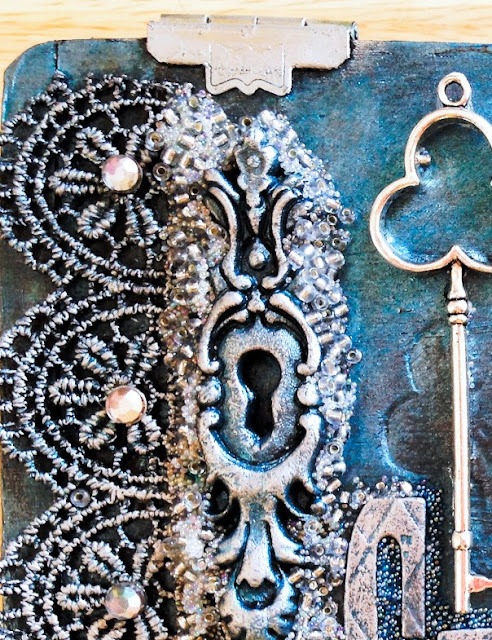 Add seed beads and micro beads on/around the Creative Paperclay pieces on the top of the box. Add micro beads around the letters and enhance the color with LSG Hydrangea Blue spray. Finish by enhancing the clasp and hinges with the Old Silver wax and adding some gems to the lace. 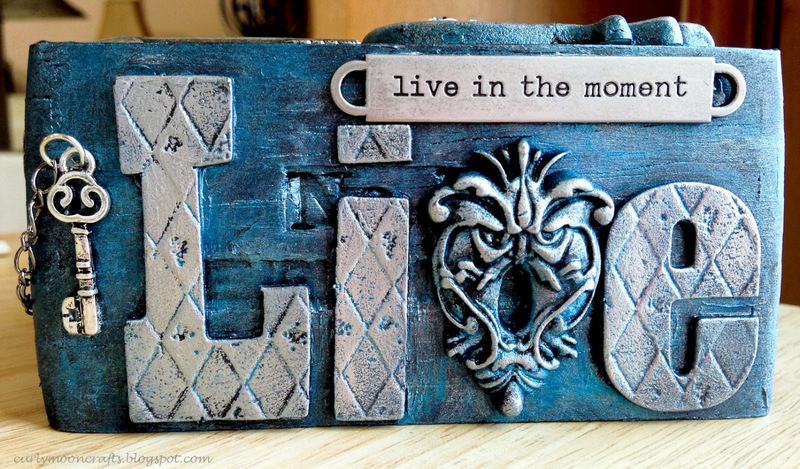 Enjoy using the box to store the rest of your Creative Paperclay pieces. Other Items: lace, seed beads, charms, wood cigar box, matte medium, black gesso, gems, jewelry pieces.